We’d love your help. Let us know what’s wrong with this preview of A Practical Guide for Policy Analysis by Eugene Bardach. To ask other readers questions about A Practical Guide for Policy Analysis, please sign up. Had to read this for a class on Policy Analysis, was pleasantly surprised. Bardach has a writing style that is easy to follow and uses relatively clear logic. The book gives the impression he is a seasoned policy analyst. This "Eightfold Path" guide to comparing and judging policy alternatives will give you an excellent base of (to be followed loosely) steps in which to approach problems in public, nonprofit sector policy as well as private organizations, although the focus is on the former two. Had to read this for a class on Policy Analysis, was pleasantly surprised. Bardach has a writing style that is easy to follow and uses relatively clear logic. The book gives the impression he is a seasoned policy analyst. This "Eightfold Path" guide to comparing and judging policy alternatives will give you an excellent base of (to be followed loosely) steps in which to approach problems in public, nonprofit sector policy as well as private organizations, although the focus is on the former two. The author also gives you what you want to know, examples, ideas, and "semantic tricks" to thinking out any of the steps he outlines, for instance: semantic tips for deciding what criteria to judge alternatives (variations on a solution). If, to give any negative critique of the book, the author dissassembles his method too much sometimes - which leaves you confused as to which step you are referring to. To give credit though, not all types of analysis (and if you read the book you will know) are straightforward "Identify Problem, Identify Alternatives to solve it, Identify criteria to rank alternatives, and then choose" and depend on the context, as well as those funding your "analysis" and work. Further, to credit Bardach, there are many pointers as well in other problem areas which are helpful, such as general project management, or even ways of structuring final reports and recommendations. All in all, this is a quick read which isn't padded with useless information, and isn't lacking in terms of advice and pointers, to the effect of having things such as appendices of "work governments do" useful to not just borrow ideas, but stimulate the thinking process. This one makes it to my top shelf, at least. This maybe a premature review. But I think my opinion about it, is set in stone: IT IS AWESOME. Going to be a bible for the next 10000 years. Read it if youre in any way interested in policy analysis and problem-solving. A brief introduction to policy analysis. Well respected author Eugene Bardach lays out what he calls "the eightfold path to more effective problem solving." This involved steps in the policy analysis process including: defining the proble,m, assembling evidence, constructing alternatives, selecting criteria, projecting outcomes, confronting treade-offs, deciding, and telling your story. This is a brief book, but serves nicely as a "quick and dirty" introduction to policy analysis. When I hear eightfold I expect it to be a path with eight simultaneous aspects. This is more like an eight-step path. Aside from quibbling about the name, the method is sound and this book is well-written with effective examples. I don't really know how often I'll refer to it in my professional life, but I'll keep it in my back pocket just in case. This book is not dry. Yes, it is an instruction book for analyzing public policy but it's so much more! With a bit of candor, and creativity one can apply these rules broader scoped problems, personal conundrums and understanding any kind of complexity of organizations, families or tribes. I love it and will refer to it indefinitely. This book cuts out all narrative senarios to give you a concise usable 100 page reference. The utility of the book in application of Policy analysis is surpassed only by its readability. I would be remiss if I didn't mention that there are other policy analysis frameworks of equal or greater value. However, none as concisely and briefly stated as the eight fold path. I think this one is a fairly good tool book. The biggest merit will be to equip readers with a analytical mindset. The higlight is the case study (I believe it's part III) of comparing the absolute and additive cost-effectiveness of three different approaches to reduce cocaine assumption. And that's just one part of the metric from the "economy" side. It is also enlightening to see another metric proposed from the perspective of social benefits - the number of cocain related crimes. Another pleasa I think this one is a fairly good tool book. Another pleasant surprise is to see the political experience being taught, like how to leverage the intricacies of psychology to deal with defensive informants, how to navigate through a bureaucracy, alongside with appendices illustrating different sorts of policies and metrics to probe into an organisation. Many books in the politics genre actually just talks about history, so it is interesting to see an analytical book demonstrating the art of politics. It's a textbook and I can't say that I read the entire thing word for word, but I did read a majority of it and took classes where it was the focus text. It's a foundational book in public policy, in that it provides the framework for a Master's Degree in Public Policy from the UC Berkeley Goldman School of Public Policy, the top ranked public policy school in the country. The book itself is well written, fairly easy to read and insightful. It's largely for practitioners, but anyone who is interes It's a textbook and I can't say that I read the entire thing word for word, but I did read a majority of it and took classes where it was the focus text. I read this book to develop some professional skills. I found the book easy to read and enjoyable. I'll probably come back to it at some point ("flipping through" ebooks is just not that fun, unfortunately). The "Eightfold Path" as a framework is fine. It's basically the "Scientific Method" taught in schools (define the problem, gather evidence, develop a hypothesis, etc). Names aside, the book explores each step in general terms as well as with specific examples. This is a fantastic textbook and fabulous resource. U Berkeley's eight-step process to problem solving is laid out in a clear, easy-to-follow manner. It's written for public policy analysis, but there are a lot of lessons here that can be used by businesses and organizations. Totally recommended. The first two parts are a good read of the do’s and don’ts of policy development and writing. But I see the appendices of checklists and writing advice as a place I’ll refer to over and over again in my career (and next semester’s workshop policy writing class). I was excited to read this book, but the structure and development overall is poor. I was not engaged though I am interested in policy development and analysis. A basic, broad overview for for new policy students. There is a standard nightmare in teen sit-coms that a protagonist should have a nightmare about showing up to school without trousers. If there were just such a nightmare for a public policy professional, this slim text would be just the cure for such an overactive super-ego. Put differently (and more clearly), I would choose this book to read if I knew I were starting a public policy job on Monday without any prior preparation. The book is very practically oriented towards the professional prac There is a standard nightmare in teen sit-coms that a protagonist should have a nightmare about showing up to school without trousers. If there were just such a nightmare for a public policy professional, this slim text would be just the cure for such an overactive super-ego. Put differently (and more clearly), I would choose this book to read if I knew I were starting a public policy job on Monday without any prior preparation. The book is very practically oriented towards the professional practices and behaviors that would allow a person to muddle through a job in the field. Without any experience myself, I won't speak to this book would be what you need to excel. I am glad I started my summer reading for public policy school with this book. Very comparable to the KKV book on social science research. Bardach presents a very straightforward description of how to conduct policy analysis, including his eightfold path. Again, similar to KKV, but certainly erring more towards using common sense than going for stringent scientific methods. However, as policy analysis and social science research aren't necessarily the same process, I think it's safe to say that the two methods aren't conflicting. “A Practical Guide” is well-written book that presents the “eightfold path” model to write a policy analysis paper. Along with the three parts, the appendices are guidebooks for writing a good paper and also getting ideas about public and non-profit stakeholders’ roles. Although the book is a good read for everyone, who would like to delve into policy analysis, it would be specifically valuable for the novices. I'm definitely going to hang onto this one! This can work both as a textbook for students to read cover-to-cover and discuss, or as a reference for practitioners. It seems like the kind of book that can serve as an inspiration when stuck or as a reassurance when about to try something new. Bardach's text is clear and concise, and the book is organized in a way that is easy to flip around. A thorough, yet brief, overview of policy analysis. It started out a bit dry and slow, but as the textbook moved along, it opened up and became a bit more interesting. It's a good starter book on the subject matter. I usually have a policy against posting work-related books here, but this one might be of general interest. It could basically be a self help book for writing memos. One of the most entertaining academic books I have read in awhile! 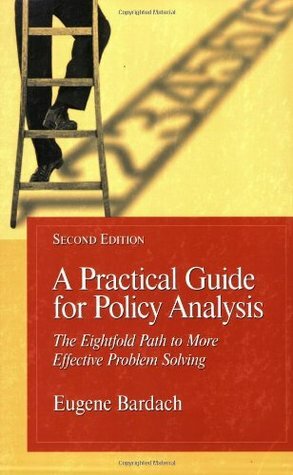 Truly great operational guide to the nuts and bolts of how to do first rate policy analysis. Should be required reading for all masters level and beyond students in public policy disciplines of any type. Also: Go Bears. this is a shout out to all my policy analysis peeps! Somewhat self evident? I don't know. Good book for people juststarting out in an MPA program. There is a lot of practical and useful information in this book that I will reference as I contine to earn my MPA. A classic text in North Americans policy analysis. Well written, and straight forward. Essential resource for scholars, teachers & practitioners alike. This one is the short version of the other policy books I had to read. This one is from real experience of the writer. VERY practical, this is basically a how-to manual on policy analysis. Short, easy to read, gets so detailed as to include advice on formatting memos and powerpoint presentations.